TAMIYA 60322 P-51D MUSTANG (1/32) scale model kit! 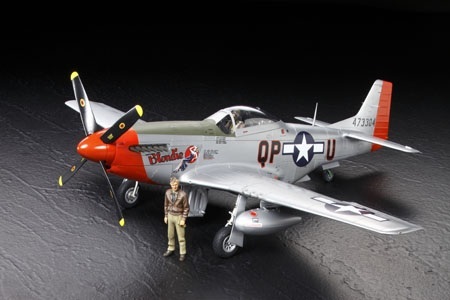 1/32 scale plastic assembly kit of the P-51D Mustang. Overall Length: 308mm, Overall Width: 354mm. Famous form of the aircraft including its distinctive wing profiles have been precisely reproduced. Radiator components are reproduced just like those on the actual aircraft. Both the radiator flap and oil cooler flap are movable. You can select either early- or late-type tails, with the latter featuring the dorsal fin. Parts for 75- and 108-gallon drop tanks are included. Comes with 3 kinds of markings to depict aircraft from the U.S. 8th Air Force. A 16 page full-color photographic reference manual is also included.